Fulbeck United lost ground on the top two in Boston Saturday League Premier when they were beaten 4-2 at home by Coningsby. 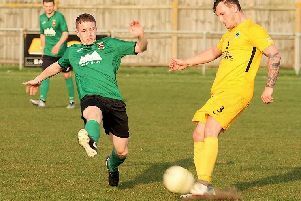 But fifth-placed Ruskington Rovers ended a run of three straight defeats to get the better of Pointon with a 2-1 scoreline, thanks to goals from Lee Llewellyn and Ashley Farmer. The win moved Rovers within four points of second-placed Railway Athletic with games in hand on all of the teams above them. Billinghay Athletic’s struggles in Division One continued when they were beaten at home to stay second-bottom. Hosting FC Hammers, Athletic were edged out 4-3 in a very tight game. In the Division Two derby, Caythorpe beat Colsterworth 5-0. Division Three Northgate Olympic progressed to the semi-finals of the Challenge Cup. The Sleaford side saw off Fosdyke 5-2 in the quarter-final on Saturday. They will be joined in the last four by Skegness Town A who needed extra-time to beat Spalding Harriers 2-0, Boston College, who beat JFC Boston 2-1, and Park United who knocked out Bull Athletic 2-0. Workforce Unlimited Premier Division (KO 2pm): Fulbeck Utd v Swineshead Institute. Workforce Unlimited Division One: Horncastle Town Res v Pointon Res. Workforce Unlimited Division Three: Northgate Olympic v Benington Res. BB Insure Willoughby Cup, round two (KO 1.30pm): Kirton Town v Billinghay Ath, Railway Ath v Pointon.